The one of a kind tray features hand selected stones collected from all around the world. Set in burnished brass, it is a soulfully chic accessory that promises to add spirit and color to any space. Made in Los Angeles. The Calia Bronze Draped Chair, executed in solid bronze, effortlessly straddles the line between furniture and sculpture. The form is that of a simple dining chair draped in heavy fabric with a decorative braided trim. When cast in bronze and polished to a high sheen that form takes on an ethereal and otherworldly quality. This ambitious addition to our line of super-luxe furniture is hand forged in our Los Angeles workshop and each one is stamped and signed. 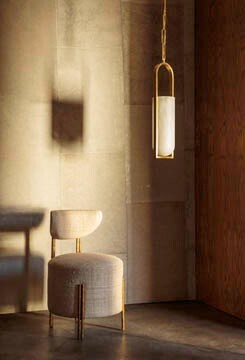 The raw un-lacquered brass is designed to slowly and elegantly patina over time and use. An incredibly dramatic addition to any interior environment.